Medium - $41.99 Only 4 left! Large - $48.99 Only 8 left! Wig and waffles sold separately! Gawrsh we love Eggo waffles! We just can't get enough of them. It's pretty hard to beat a delicious plate of waffles, smothered in syrup and dollops of butter. You could just sit there in anticipation of eating, watching the waffle pockets slowly absorb the sugary syrup goodness. Or you could be like us and just dig in. In fact, you'd have to be pretty strange to not want to immediately indulge in waffle goodness the moment they come out of the toaster! Which brings us around to this costume. Cause we've heard there's a strange girl who's new to the scene, and she's way (like WAY) into waffles. We totally can't blame her, and in fact, we'd kinda like to emulate her. And now you can do that yourself when you get this signature Strange Girl costume. In fact, it's so awesome, we'd rate it as eleven out of ten! 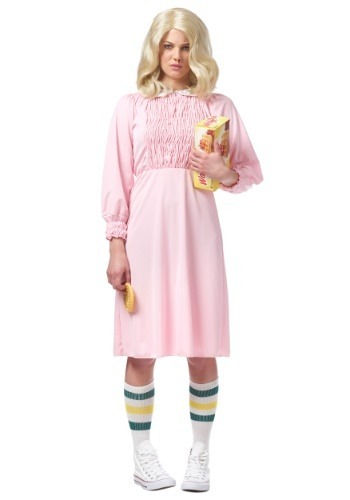 This costume look features a pink collared dress that secures in the back. Athletic striped tube socks are included for a little retro style, and if you want to complete the costume effect, you're just going to need the Strange Girl wig (sold separately). And, of course, you're going to have to BYOEW... Bring Your Own Eggo Waffles. We'd be happy to sell them to you, but we just don't think they'd be very delicious after being shipped to you in a HalloweenCostumes.com delivery!